Welcome to our new blog courtesy of WordPress.com. Our Facebook page started in March 2018 and our Twitter account followed not much later. It seemed natural that as we build our following that we start a proper blog that can link to both accounts so we can talk more and show more! 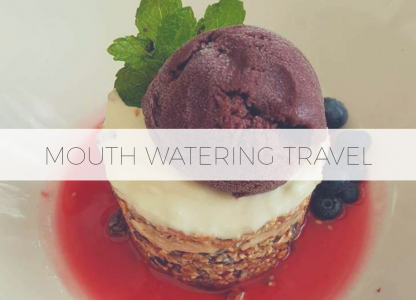 So, welcome to Mouth Watering Travel – run by Laura and Tara, a couple of almost 8 years who still haven’t got round to making it official as we prefer to spend our hard earned cash on holidays than on a wedding….! Maybe one day we’ll combine both? Mouth Watering Travel started after our holiday to Thailand at the beginning of 2018. Whenever we go on holiday, we set up a WhatsApp group for our family so they know where we are and what we’re up to. When we got back, my sister Helen said “you should write a blog but all the pictures you send us are of food!” We thought “What a great idea! Why can’t we talk about, and share with others, two of our favourite subjects – travel and food?” So we did. If it doesn’t work out, we’ll just blame Helen! The idea behind the Facebook page and Twitter account is not just for us to share our adventures and pictures. It’s open for everyone to send us their recommendations and talk about issues they may have come across. Do you have a favourite restaurant? Let us know, we’ll take your review and promote it on our page. Want to share an idyllic beach location for others to enjoy when they visit a particular country? Let us know and we’ll share it. We want to build a community where travellers can come and see what’s great to do and where! What about Tara and me? What kind of travellers are you, I hear you ask? Well, Tara’s the planner – she will pack a suitcase as soon as the holiday is booked given half a chance – even if that is six months away which can make it awkward when I’m looking for a favourite t-shirt! She is the one who will sit happily at a laptop looking for great deals to exotic places that we’ve never been to. Then we create the adventure together. No sitting on a beach for weeks at a time for us two! Oh no! We like to get out and about, no sitting still. We love markets, local restaurants or street food, excursions, taking local transport (still recovering from the tuk-tuks in Thailand!) or hiring a car and exploring whichever country we are in.